The hotel is in a prime position in Scotland's second city, located a few minutes from Glasgow's shopping centre, museums, galleries, exhibition centres and sporting venues. The 5-star Glasgow hotel dates from 1823, and was once the home of the Royal Scottish Automobile Club. 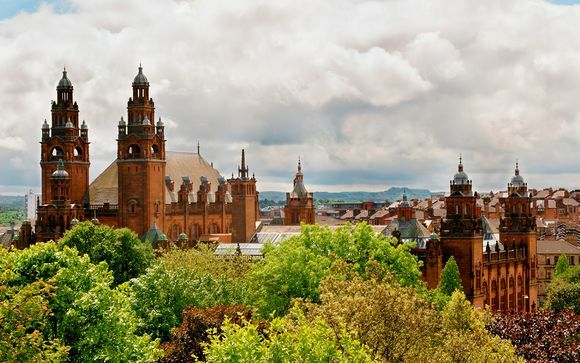 Glasgow offers a blend of internationally-acclaimed museums and galleries, stunning architecture, vibrant nightlife, fantastic shopping and a diverse array of restaurants and bars. Scotland's biggest city has evolved over the last few decades to become one of Britain's most interesting cities. This city is the perfect combination of Victorian grandeur and stylish bars, its edgy atmosphere and legendary friendliness is intoxicating. This is a city of city shopping centres, bustling exhibition centres and fascinating museums waiting to be explored. This large Georgian townhouse is nestled on a quiet Glaswegian square, just moments from some of Glasgow's most evocative sights. This hotel takes its classic architecture and accentuates it with modern touches that breath new life into this historic building. So come and explore Glasgow, then relax in a hotel with ample amenities from a vast, award-winning spa to the sophisticated Salon Bar. The building has a spacious and glamorous feel, and its share of original features dating from the days when it was the headquarters of the Royal Scottish Automobile Club, during the golden age of motoring. Tastefully decorated with marble bathrooms, these classic rooms with modern amenities make for an ideal base to explore Glasgow. - Standard Double / Twin Room (27m² / max. 2 persons): These airy rooms are a welcome retreat whose neutral decor and contemporary flaire will lull you to sleep. - Superior Double / Twin Room (29m² / max. 2 persons): These rooms combine sophisticated surroundings with modern amenities to enhance your stay. - Deluxe Double / Twin Room (40m² / max. 2 persons): Enjoy the best of both worlds with classic touches like marble baths and modern necessities like free Wi-Fi and a flat-screen TV. - Junior Suite (50m² / max. 2 persons): Incorporating unique touches of Harris Tweed, these tastefully appointed suites include a separate lounge area, free Wi-Fi, and a flat-screen TV. - Executive Suite (65m² / max. 2 persons): These rooms have a spacious & glamorous feel, here the building's original features are blended with modern glitz to create a space that invites you in after a day exploring Glasgow. Vibrant and chic décor reflect the history of the former RSAC ballroom to create a unique atmosphere where guests enjoy seasonal dishes inspired by Scottish classics such as cured Loch Etive trout. 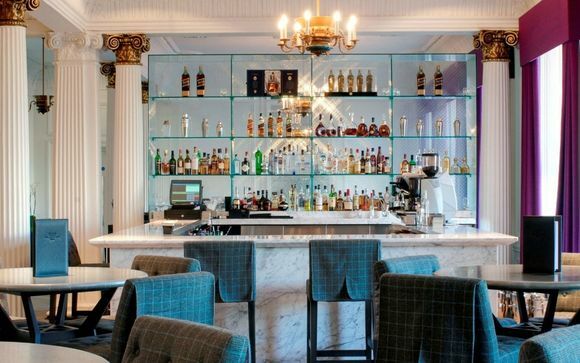 The Restaurant at Blythswood Square is sure to impress with private booths, classic Harris Tweed furnishings, and rich details. The Salon, rated by Class magazine as one of “the best bars in the world,” serves up inventive cocktails and provides a wide selection of beer, wine, and spirits. 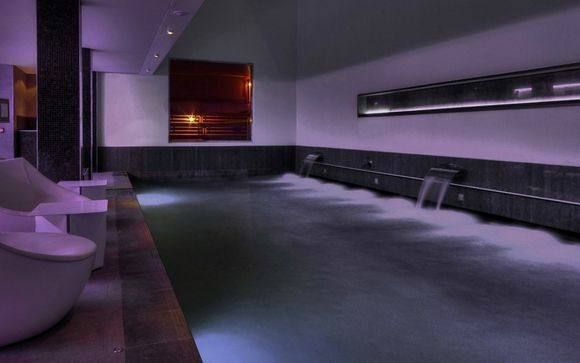 Feel refreshed and rejuvenated in the hotel's 10,000-square-foot spa facility incorporating 9 luxury treatment rooms, a thermal suite, 2 relaxation pools, a lounge and café area, plus several additional relaxing areas. Hotel guests have complimentary access to The Thermal Experience from 7am-9am and 6pm-9pm. 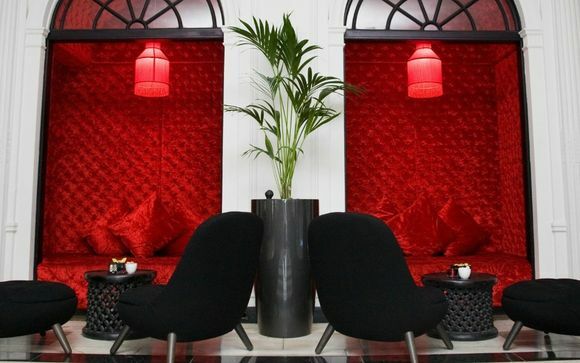 Your hotel is approximately 8min / 600m from Charing Cross Station.